Eli Brayley - What Hath God Wrought! Brothers and sisters, I've cleaned up the audio section on the site by removing some of the dead links and fixing some of the broken ones, so now all the uploaded files are in working order and you are able to listen to everything that is available online. May the Lord use them for the furthering of His Kingdom and glory. Blessings! In the tenth chapter of the Gospel of John, our Lord Jesus Christ, in His discourse with the Jews, gave the world some of the most wonderful truths contained in a short series of familiar parables. 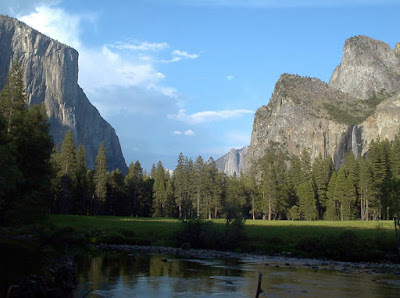 These parables are the famous 'sheep parables' which many of us are well acquainted with, though I think it will be profitable to expound upon them, and write about some of the things God has been revealing to me in these passages. One of the first mistakes people make in reading this portion of Scripture is that the object of who is being spoken of is often misunderstood. "Verily, verily, I say unto you, He that entereth not by the door into the sheepfold, but climbeth up some other way, the same is a thief and a robber." To this it is usually taken as speaking of those who are trying to get to God some other way than Christ; those who attempt to jump over the wall to eternal life instead of going through the rightful door, Jesus Christ. However, this is not so, for the next verse states: "But he that entereth in by the door is the shepherd of the sheep." It is clear that this is not speaking of the sheep trying to get to God, but of the shepherd coming to the sheep, and also of those false prophets (strangers) who attempt to come in and steal the sheep. "He that entereth not by the door into the sheepfold..." Jesus is warning the people of false teachers who come to the sheep as thieves and robbers. What is fascinating in this scenario is the roles that Jesus Christ ascribes to Himself. In verse 7, He declares, "I am the door of the sheep", and in verse 11 and 14, "I am the good shepherd." 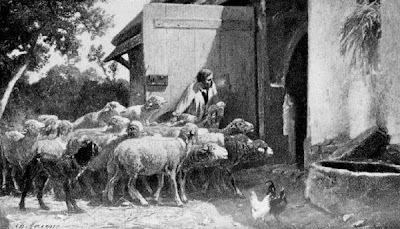 Christ is BOTH the door to the sheepfold AND the good shepherd who enters in by that way. The significance of this is that Christ is not only the Way by which we are saved, but He Himself also is the Shepherd that leads us into that Way. He did not merely send prophets to preach about salvation... He Himself came to earth and showed unto men the Way of salvation. He did not point the way, as so many religious teachers do, but He declared to all men, "I AM the Way." The Shepherd Himself is the Door, and His sheep hear His voice, and follow Him through the Door into green pastures. The Lord Jesus Christ is both the Door of salvation, and the Shepherd that leads us through the Door of salvation. 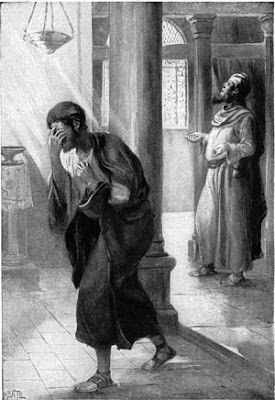 All that ever came and preached to men some other way to be saved other than by the sacrifice of the Son of God was a thief and a robber, and all that have ever come since Christ, and preach another "door" other than the true Door, seeks not the good of the sheep, but their destruction. Jesus Christ is the everlasting Door whereby men MUST be saved. He is the "Lamb slain from the foundation of the world", and Christ alone is the sole foundation for all those who will inherit eternal life. Let this be known, preacher! Declare it loud and strong! As one who is an overseer to the flock of God (Acts 20:28-31), preach Christ and Him crucified, for if He be lifted up He shall draw all men unto Him. There is no other Name by which men must be saved. Christ is the good shepherd, and the good shepherd is defined as "laying his life down for the sheep." "For even the Son of man came not to be ministered unto, but to minister, and to give his life a ransom for many." (Mark 10:45) The Lord Jesus Christ did not come the first time to be served, but to serve, just as the shepherd does not enter the sheepfold to be served by the sheep, but to serve the sheep; to heal their wounds, to feed them milk and grain, and to lead them out into pleasant pastures. It is now, having been redeemed, that we serve the King of kings, just as the flock serves the purpose of the shepherd once they are led forth into the place where he bids them. "I am the good shepherd, and know my sheep, and am known of mine." Now this is the question for the ministers of the flock today: are you a good shepherd, or are you a hireling? "He that is a hireling, and not the shepherd, whose own the sheep are not, seeth the wolf coming, and leaveth the sheep, and fleeth: and the wolf catcheth them, and scattereth the sheep. The hireling fleeth, because he is a hireling, and careth not for the sheep." The hireling is tending the sheep only for selfish gain, and not because he loves the sheep. The hireling is using the sheep for his own profit, but once there is danger he no longer cares what happens to them. The hireling sees that a sheep is missing from the flock, but is too lazy to go and search for it that he might find it. I am sad to say there are many hirelings overseeing the Church today. When God became a man and dwelt among us, it was because He came to seek and to save that which was lost. The whole world was lost, separated from their God, because of sin. "All we like sheep have gone astray; we have turned every one to his own way..." (Isaiah 53:6a) Through our pride and self-will, each one of us left the safety of the Shepherd and wandered away to seek our own fortune; but we quickly fell victim to the wolves, the jagged ranges and the perilous night. Our loving Shepherd saw that we were missing and came running over the mountaintops and through the valleys in search for the missing sheep. The Scripture tells us how Christ came to give His life a ransom for many... "and the LORD hath laid on him the iniquity of us all." (Isaiah 53:6b) Bloodied, bruised and beaten, Jesus hung upon the cross bearing our sin in His own body so that the righteous judgment of the Law could pass over us, we who rightly deserved it. Through the death of the Son all men everywhere can be saved from the judgment of sin. But now Christ is alive from the dead! And the Scriptures says that "whosoever shall call upon the name of the Lord shall be saved!" (Romans 10:13) Little lamb, do you not hear Him calling? Call upon your Shepherd! You who are stuck in the thorny thicket, lost and separated from the flock, let your bleating cry sound forth into the night, for the good Shepherd searches for you, and when you call He shall hear you, and He shall swiftly come, and shall lift you onto His shoulders, and shall carry you back to the safety of the Father's sheepfold. Yes! Call on the name of the Lord Jesus Christ this very day, and you shall be saved! These two verses and the two that follow contain the first explicit mention of the word "law" in the book of Romans, but though the word is first explicitly used here, the concept of and discussion of law is already well underway since chapter 1 and the previous part of chapter 2. Immediately prior, Paul has just been talking about the righteous judgment of God, how God will judge the world, both Jews and Gentiles, according to what they did, whether they did good or whether they did evil (2:6-11). This is evidently moral. The unrighteousness he is talking about carries over from chapter 1 (see 1:29-2:5ff). From chapter 1 the whole discussion has been moral, and thus far nothing has changed and nothing new has been introduced. In light of this moral judgment, those who sin without the law (that is, the Gentiles. See further explanation below on v. 14-15) will perish, and those who sin in the law (that is, the Jews) will perish. Only those who not only know the good but do the good will be justified on judgment day. Here, "justified" is the word διχαιόω, which is a verb form of the noun διχαιοσύνη, which means "righteousness", a word featured prominently already in chapter 1. In the light of its use in chapter 1, as well as the immediate context here in chapter 2, it is perfectly evident that to be "justified" means to be declared morally righteous in God's judgment. This is still in the first passage where the word "law" is mentioned in the book of Romans. The law, as expressed here, cannot mean the ceremonial law but the moral law, since the Gentiles prove that the moral, not ceremonial, law of God is written on their hearts by their actions; their consciences also bearing witness and accusing them before God. The law here is described in moral terms: the Ten Commandments. The Jews were hypocrites in telling other to keep the law when they themselves broke it. Continuing on from verse 23, Paul actually contrasts circumcision with the moral law. He states that circumcision only profits you if you keep the law (meaning, you can have all the ceremonies done perfectly, but if you fail at the moral law it all profits you nothing). He then goes on to say that if the uncircumcision keep the righteousness of the law (obviously moral) their uncircumcision is counted as circumcision. So the ceremonial and moral is contrasted. The law, here, clearly being moral. After Paul describes the immoral condition of both Jews and Gentiles in verses 9-18, he then shows how it is the law that reveals to us this true condition of ours. "By the law is the knowledge of sin" (the sin just described in verses 3:9-18). This, then, is the moral law, which makes every man, Jew and Gentile, guilty before God and without excuse. Therefore by the deeds of the moral law shall no flesh be justified in his sight. Since no man can be justified by keeping the moral law, righteousness must come to us apart from that law. The answer is the righteousness of God which is given to moral sinners through faith in Jesus Christ. There is no difference... Jews and Gentiles alike have sinned against the moral law, and receive this righteousness "apart from the law", through faith in Christ. Christ died on the cross for our sins (our moral failings). In His death He suffered the punishment that should have fallen upon us, Jews and Gentiles, for our moral sins. If Paul were merely saying that we did not have to keep the ceremonial commandments, but that we still were required to keep the moral commandments, then his point would fall apart, since a man could still boast that he worked for his salvation - he obeyed the moral law. But Paul's point is that all boasting is excluded because justification comes to us apart from works, any works whatsoever. God alone gets the glory, because God alone does the work; it is only for us to believe. Several verses earlier in chapter 4, Paul writes that "if Abraham were justified by works, he hath whereof to glory; but not before God." Moral works are spoken of here, since Abraham knew nothing of the ceremonial law at the time he was justified by faith (Genesis 15:6). Paul continues in verses 13-16. He states, "the law worketh wrath: for where no law is, there is no transgression." This wrath is the same wrath Paul has been speaking about at length: the righteous judgment of God being stored up against the immoral, whether they be Jews or Gentiles (Romans 1:18, 2:5,8). The law which accuses is the moral law which men have broken. The only way to be saved is by grace, not by obeying the moral law (for then it would not be by grace, Romans 4:4,5, 11:6)! It is only by grace if it is through faith, because faith, rather than working, trusts in the gracious work of another. In this we become the children of Abraham, "the father of us all" who believe. The presence of sin was in the world, but the knowledge, and therefore the imputation, of sin was not, until the law came and revealed it. This is evident by verse 20, which says, "Moreover the law entered, that the offense might abound." By this it is evident that what is spoken of here is the moral law, for "the offense" before the law was not ceremonial but moral in nature. This verse makes it unmistakably clear that Paul's whole argument has been that people are not justified by the moral law, since the objection raised against Paul is as follows: "What then? If we are not under the moral law, shall we sin?" Such an objection would never be raised if Paul were arguing about the ceremonial law. In context, the sins being spoken of are moral, such as lust, uncleanliness, etc., all which were previously condemned by the law, and now, for the Christian, are restrained by grace. "For sin shall not have dominion over you: for ye are not under the law, but under grace." Our relation to the law was taken out of the way through the death of Jesus Christ for our sins. Jesus redeemed us from the curse of the law by becoming a curse for us (in our place), hanging on the tree. He bore our moral sins in his body: all the iniquity which we had committed against God's law were placed upon Him (Isaiah 53:6). 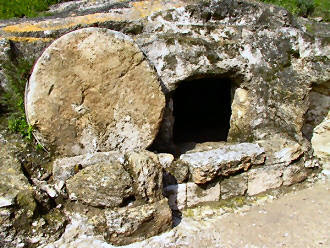 He suffered and died, and thereby we died to law: it having no more controversy with us. Now, because we are free from the law, can we bear good works for God, since it was the law that stirred us up to rebel (v. 5). The law here is the moral law by the evident reference, "Thou shalt not covet." Nothing else can be inferred here but the moral law. The law is indeed holy, just and good. It was given for the express purpose of exposing sin in us, so that sin, by the law, might appear exceedingly sinful. The successful ministry of the law produces in us the following disillusioned confession: "For we know that the law is spiritual: but I am carnal, sold under sin." It is the moral law alone that can do this. The moral law was unable to make us righteousness before God. God's contention with the Jewish people was not that they had failed the ceremonial law but that they had failed the moral law (for even the failure of the ceremonial law is a moral issue!). Because of this God sent His own Son into the world, and for sin, condemned sin in the flesh, so that the moral righteousness of the law might be fulfilled in us "apart from the law", by faith in Jesus Christ. The carnal (fleshly) mind is not, and cannot, be subject to the law of God; it is in enmity against God Himself! This is a serious moral crime. What hope can we sinners possibly have if we are not made right with God by trusting in the death and resurrection of Jesus Christ alone? Israel sought righteousness before God by the works of the law, which was neither the purpose of the law nor possible by the law. "Righteousness" in the Old Testament is everywhere moral (ex. Jeremiah 22:3). Israel did not learn the lesson of the law: that they are morally bankrupt (Romans 7:12-14, Galatians 3:21-24). And so, through pride and self-righteousness, they refused to look to Christ for righteousness and still remain under blindness to this day. All hinges upon "the righteousness of God" or "their own righteousness", and the deciding hindrance is man's own ignorance. "By his knowledge shall my righteous servant justify many." 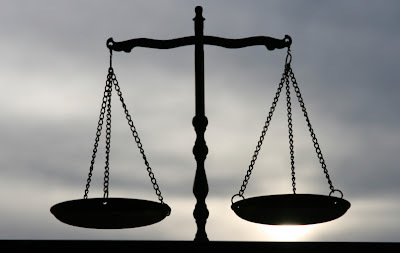 (Isaiah 53:11) Moses describes the righteousness of the law like this: the man that does them will live by them. "Ye shall therefore keep my statutes, and my judgments: which if a man do, he shall live in them: I am the LORD." (Leviticus 18:5, immediately followed by a list of moral commandments) This, says Paul in Galatians 3:10, is the curse of the law; a curse to men, because no one can do it due to our sinful depravity. Jesus "became a curse for us" and delivered us from the curse of the law (literally, Jesus delivered us from the principle, "the man that doeth those things shall live by them"). Christ is the end of the moral law for righteousness to everyone that believeth; both for Jew and for Gentile. "For there is no difference between the Jew and the Greek: for the same Lord over all is rich unto all that call upon him. For whosoever (no matter how sinful!) shall call upon the name of the Lord shall be saved." Again, more certain proof that "the law", to Paul, was essentially moral. Therefore we conclude that the meaning of the word "law" in the book of Romans evidently refers to the moral commandments, and that a man, whether Jew or Gentile, is justified before God by faith in Jesus Christ without the deeds of the moral law. 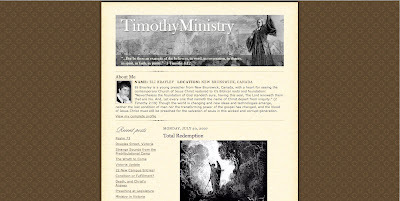 TimothyMinistry.com - Two Year Anniversary! Today, September 29, marks two full years of online ministry since this website was first created in 2005. Since then, multitudes of people have passed through and been blessed by the articles, videos and updates the Lord has allowed me to make available. I praise God for the amazing things He has done through this site. I've received countless numbers of emails from Christians and non-Christians alike sharing how they have been impacted and lives have been changed. All glory for all things goes to God, and His Son Jesus Christ, without Whom nothing would be possible. Since leaving for Utah earlier this September, God has done many marvellous things for which we are bound to give Him all the glory. 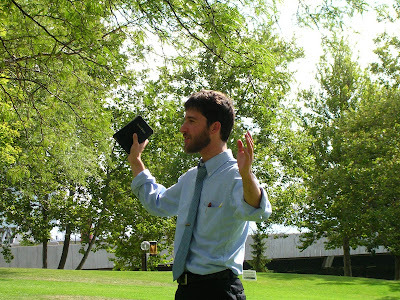 To say the least, Cache Valley and the surrounding areas have had the Gospel boldly proclaimed to them on campuses, through newspapers, by tracts, via online, etc, which has caused no small stir among the densely populated LDS community here; and not only among the Mormons, but this time in Utah has proved to be a tremendous blessing for myself, and for the Christian body here in the valley, as young and old stand together in "one spirit, with one mind striving together for the faith of the Gospel." (Philippians 1:27) It has been wonderful to see so many Christian brothers and sisters rise up to answer the call of the Great Commission in there own city. Bless the Lord! 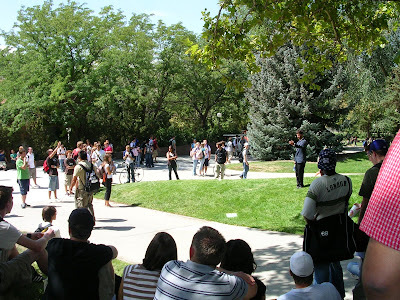 University of Utah, Salt Lake City, was the first campus we preached the Word on, and the Lord blessed us with two great days of proclaiming Jesus Christ to both large and civil crowds. It was a great blessing to preach again with my old traveling mate, Evan Schaible, and also to be joined by several locals from Logan and the surrounding vicinity. 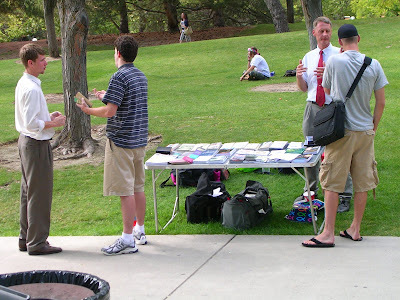 Brother Brad Scheelke of Oasis Books, a literature mission in Logan, provided many free books to be given away during the course of the outreach. 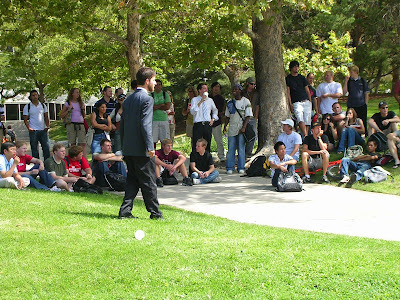 I began preaching the first day and it wasn't long before a crowd of about 100 gathered, and then Evan got up to preach, a class change hit, and the crowd nearly doubled in size. 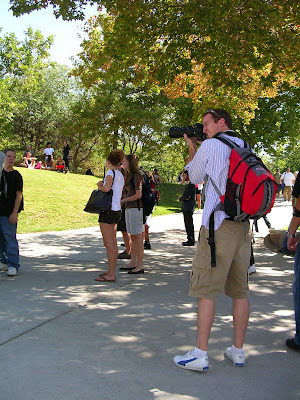 A photographer for the university's newspaper snapped some photos of Evan. We made the paper almost immediately. The second day was also a wonderful day of evangelism, yet was quite different. 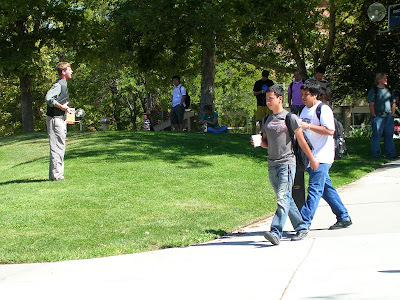 Students were very civil and sat upon the grass making the atmosphere more like a Bible study. 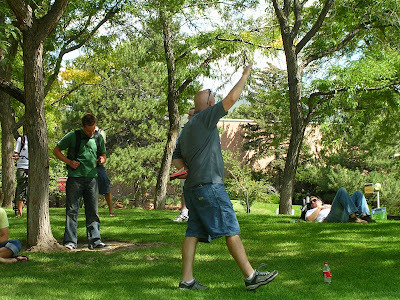 Brother Brad Scheelke spoke to students for several hours about sin, repentance, righteousness, forgiveness and God. It was awesome to see students asking questions and learning about what the Scriptures teach about salvation. 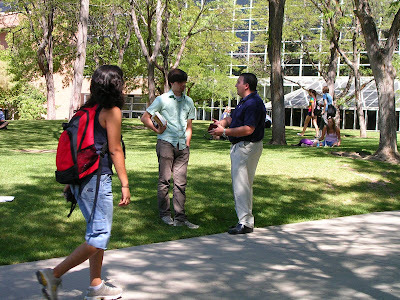 Brother Andy Bird witnessing to a young man. 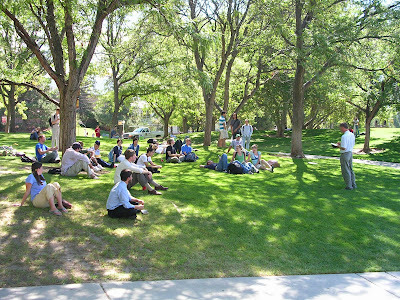 Above, brother Tony Barraclough preaches to students on the lawn infront of the university's Student Center. I first met Tony while preaching in Las Vegas last school year. Brad and Evan speak to inquirers around the book table. One of the great strongholds in Utah is Mormonism, an American cult that was formed in the 1830's by a young man named Joseph Smith. 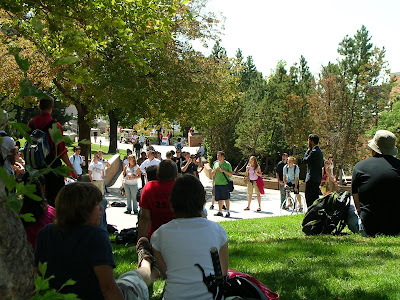 Today, there are nearly six million Mormons in the United States alone. Logan, the city where I am currently staying, has been said to be the highest concentration of Mormons in the entire world. I will be writing more about Joseph Smith and those who follow him in the future. 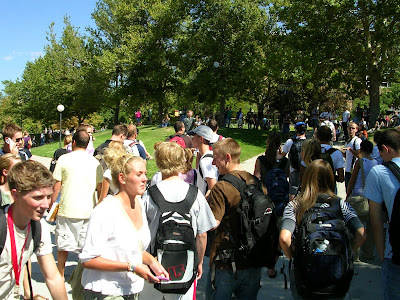 While on UofU, approximately 40% of the students we encountered were LDS. Here is a video from the University of Utah, it's about 20 minutes long and deals with many different issues that were raised while we were on campus. Praise God for the work He is doing by His Spirit in this strange and difficult State. It is an honor to lift up the name of Jesus to so many who have never heard the real truth of the Son of God. Please pray for us, saints, while we continue to reach out to these poor blind people. They desperately need your prayers; that Satan would let them go and that the glorious light of Christ would shine upon them and set them free from all that binds them. Praise the Lord, for He is doing it! I will post a new update very shortly, for we have been preaching for several weeks already and I have much to write about. Until then, the Lord bless you and keep you all. Grace and peace in Jesus Christ. The eleventh verse in Acts chapter 1 reveals to us the very first words spoken immediately following our Lord Jesus Christ's ascension into heaven; a message of foremost importance which God in His wisdom delivered to the awe-inspired apostles as they stood breathlessly gazing up to heaven on the Mount of Olives. Jesus had just ascended, and two angels suddenly appeared to announce again the promise of our risen Saviour's future return. What a fitting time for such a proclamation! How this would infuse hope and strength into the Apostles' hearts! It would do us well to seriously examine such an announcement as this, for I believe the reason why there is so much confusion surrounding the doctrine of the second coming of the Lord is because we have failed to take to heart this first and most fundamental Scripture concerning it! Right away we notice a very important phrase, "this same Jesus". Oh, I am glad the Holy Spirit inspired the angel to say this little phrase! For He knew that in the future many false doctrines would arise to try and confuse this very solemn fact. Today I have heard the strangest teachings put forth on the Second Coming of Christ... some have said that the Church, the corporate Body of Christ, is the fulfillment of the coming of the Lord to earth. Others have said that Jesus has already returned in a spiritual or ethereal way. But that is not what our Bible says. "This same Jesus!" It is He, the risen Lord, whom we are expecting. That 'this same Jesus' is to be clearly represented upon our minds is no light matter according to the Holy Scriptures. Paul was full of godly jealousy to protect the Bride of Christ from similar error. In 2 Corinthians 11:4 we read, "For if he that cometh preacheth another Jesus, whom we have not preached, or if ye receive another spirit, which ye have not received, or another gospel, which ye have not accepted, ye might well bear with him." 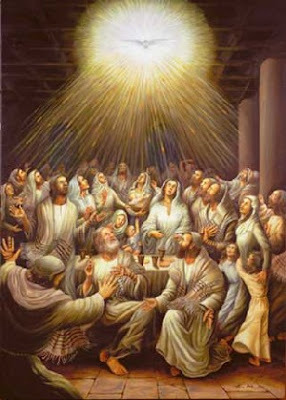 Peter, when preaching to the Jews on the Day of Pentecost, emphatically declared, "Therefore let all the house of Israel know assuredly, that God hath made that same Jesus, whom ye have crucified, both Lord and Christ." (Acts 2:36) Jesus Christ is the same yesterday, today and forever. (Hebrews 13:8) Anytime the Bible is speaking about Jesus, it is never meaning another Jesus in some alternative way; it is always referring to this same Jesus, "the man Christ Jesus", who was born of a virgin, crucified on a cross, buried in the grave and resurrected the third day. The subject is clear: Jesus, the same Jesus who ascended before their very eyes into the clouds of heaven, will so come again in like manner as they had seen Him depart. 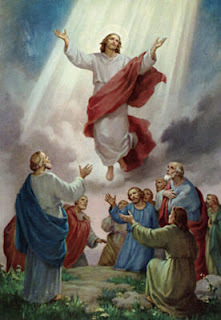 We come now to examine the actual details of our Lord's ascension, for as the angel announced, "This same Jesus, which is taken up from you into heaven, shall so come in like manner as ye have seen him go into heaven", and therefore such details illustrate a direct parallel with Christ's future return. Again, I thank the Holy Spirit for inspiring these words, for now we find in such a simple announcement exceedingly useful prophetic insights. 1. The first parallel we shall notice is that Christ ascended from earth to heaven, and therefore He shall return from heaven to earth. There are many people who believe that Jesus will not again return to earth but will only appear in the sky, however this passage does not allow for such an interpretation, nor does the whole of Scripture for that matter. The Word of God is clear that when Jesus comes He shall descend from heaven to earth as our text reasonably indicates. Christ shall once again set His foot down upon the earth, only this time as earth's rightful triumphal King, and then shall be the times of the restitution of all things, for as it was at the beginning, so shall it be in the end, when once again "the tabernacle of God shall be with men." What a wonderful conclusion! 2. The second parallel in this passage is that of His ascension in the clouds. "And a cloud received them out of their sight." This is a foreshadowing of Christ's final return in the clouds, as Jesus Himself stated in Matthew 24:30, "And then shall appear the sign of the Son of man in heaven: and then shall all the tribes of the earth mourn, and they shall see the Son of man coming in the clouds of heaven with power and great glory." There are numerous verses in both the Old and New Testaments that foretell the great day of the Lord, when Messiah shall descend in the clouds of heaven. Consider the psalmist in Psalm 104, who spoke of the majesty of the Lord's power, singing, "Who maketh the clouds his chariot: who walketh upon the wings of the wind." (Psalm 104:3) The Apostle John wrote in the opening of the Book of Revelation, "Behold, he cometh with clouds; and every eye shall see him, and they also which pierced him: and all kindreds of the earth shall wail because of him. Even so, Amen." (Revelation 1:7) It is not an accident that this detail is mentioned in our text. -And while they looked steadfastly toward heaven as he went up-Ye men of Galilee, why stand ye gazing up into heaven? What care the Holy Spirit took in choosing such words! It is not surprising that this same emphasis is found all throughout the Scriptures which deal with our Lord's second coming. As we have already read in Revelation 1:7, John does not neglect to highlight this very truth: "...every eye shall see him", and also as we have read of Christ's own words in Matthew 24:30, "...they shall see the Son of Man coming in the clouds of heaven with power and great glory." When the Lord returns what a sight that will be to all the inhabitants of the earth! Jesus said "as the lightning cometh out of the east, and shineth even unto the west; so shall also the coming of the Son of man be." (Matthew 24:27) There is nothing secret about this at all. 4. The last parallel we can draw from this passage is found in the last verse, "Then returned they unto Jerusalem from the mount called Olivet, which is from Jerusalem a sabbath day's journey." The place from which Jesus ascended was the Mount of Olives, and to that very place will He return once again, setting His foot down, when He comes to be glorified in His saints and rule the nations with a rod of iron. To this we turn to the prophet Zechariah, the fourteenth chapter and read, "Then shall the LORD go forth, and fight against those nations, as when he fought in the day of battle. And his feet shall stand in that day upon the mount of Olives, which is before Jerusalem on the east, and the mount of Olives shall cleave in the midst thereof toward the east and toward the west, and there shall be a very great valley; and half of the mountain shall remove toward the north, and half of it toward the south." (Zechariah 14:3-4) It is no coincidence that today there is a major fault line that runs under Jerusalem and through the Mount of Olives, and if there should be a great earthquake then that mountain would split entirely in two forming a great valley from the Mediterranean Sea in the west to the Dead Sea in the east. We know that when Jesus Christ returns this will be a reality, a direct fulfillment of this prophecy in Zechariah. 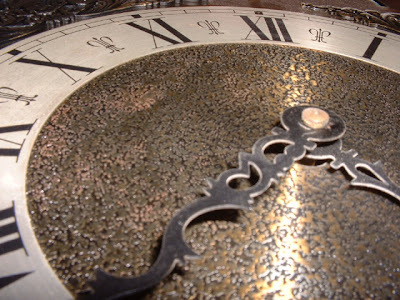 I find it extraordinary that throughout the Bible there is only one hope and one glorious coming ever expected at the end of the age, whether it be from the scroll of the prophet Isaiah to the Book of the Revelation of John, from the Olivet Discourse to the angelic announcement after the ascension, or from Enoch the seventh from Adam to the letters of the dear Apostle Paul. There is but one event described, and only one event ever anticipated. That one event is our blessed hope, the glorious appearing of our great God and Saviour, Jesus Christ. May we never lose sight of the Church's great expectation.